Feeding ducks is so much fun! And those boats are so beautiful! Jen recently posted..Why my laptop works! I agree all around, Jen! What super cool boats! I love them (and that Maine still has a wooden boat industry/community). It’s so fun to see the wooden boats built and maintained. So much cooler than fiberglass! The boats really made the scenery. 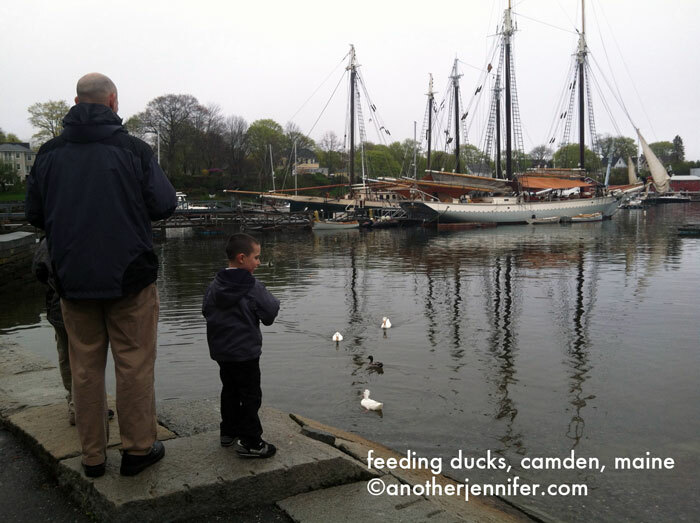 And, yes, feeding ducks is just fun. These ducks looked like they had little mohawks. They were cute. Fun despite the gray day. Definitely. The sun didn’t come out until we were on our way home, but we still had fun! It’s so enjoyable to go down to the lake to watch the ducks. Yes! This was in Camden Harbor. Such a pretty area. It is, Ashley. Come on up! We are lucky enough to have a pond at the end of our street that is home to 3 ducks. My son named them Lady, Gus, and Cheetah. He loves feeding them and we try to go visit them everyday. We’ve finally gotten them to the point where they eat out of our hands. I love feeding ducks. Its a great childhood memory! that kid must have enjoyed it a lot! 🙂 nice shot! We all had a ball! The only problem was a mean seagull who tried to steal the bread. Luckily he didn’t stay around long. Love the ships in the background. Lovely! I want to be there too! It was taken after a really great late brunch on Mother’s Day. Camden is beautiful. It’s a bit of a drive for us, but so worth it! love Camden!!! worth the drive for sure! can nearly smell the harbour’s open water. I love your pic! The boats in the background are awesome! Thanks for stopping by my blog! The boats were really cool. It was fun to see the people working on them. Thanks for stopping by here!